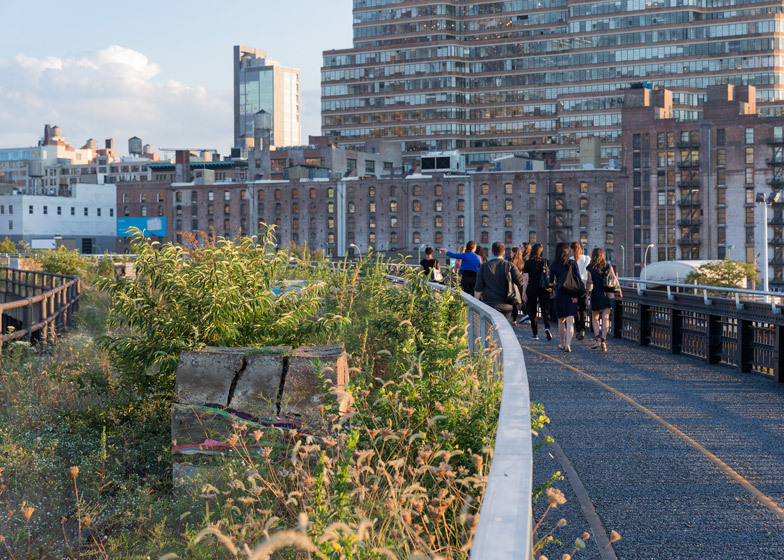 View looking west along the Interim Walkway. 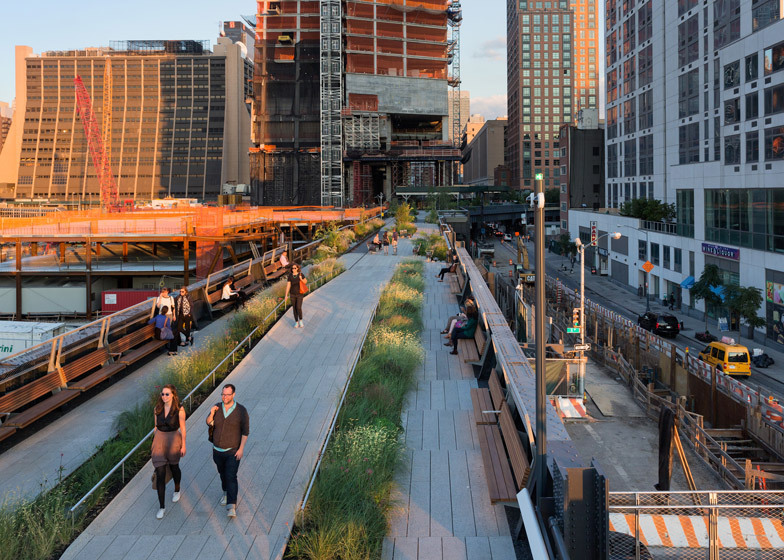 View looking west along the Interim Walkway, where the High Line begins to curve north along 12th Avenue. 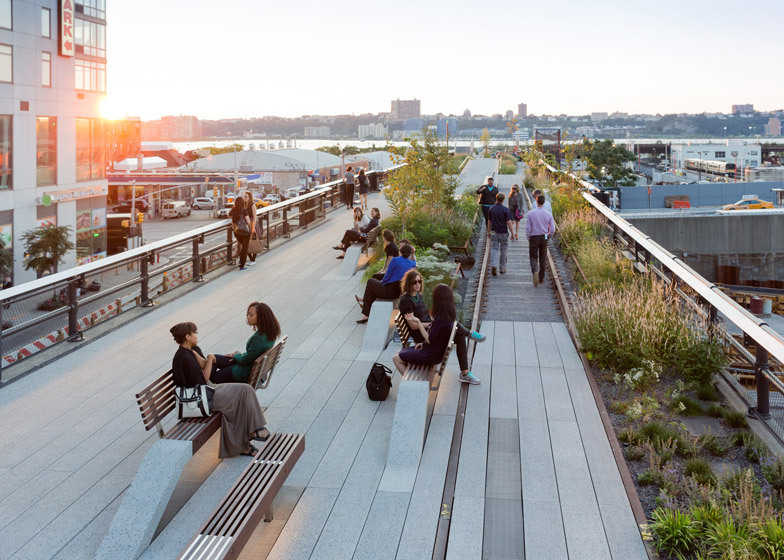 The Evolution of God is visible in the foreground. 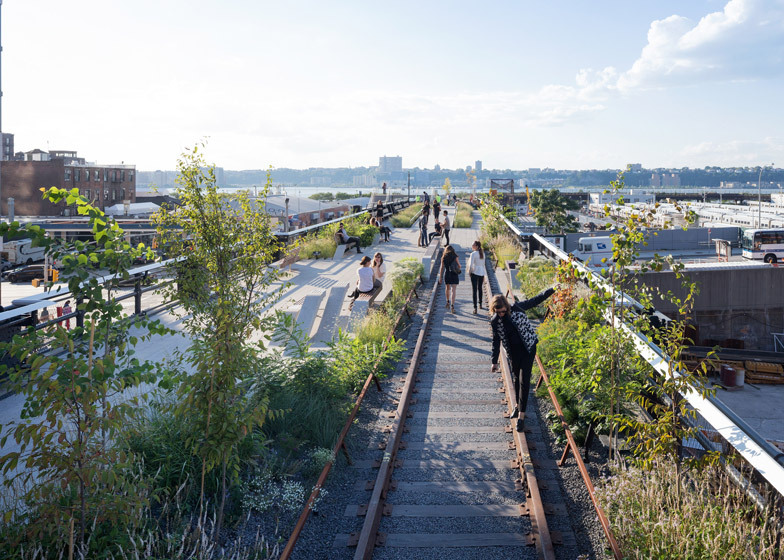 News: this week marks the opening of the High Line at the Rail Yards, the third and final phase of New York's popular elevated park on a disused railway line (+ slideshow). 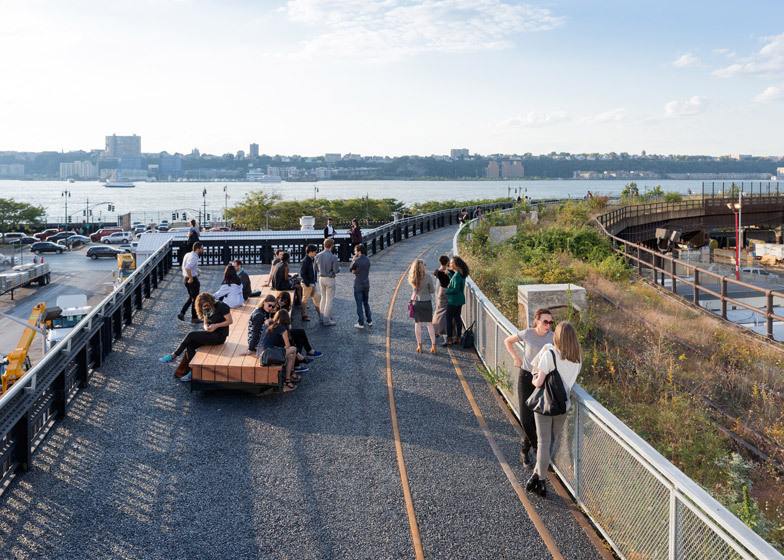 It extends between West 30th and West 34th Streets to the south and north, and 10th and 12th Avenues to the east and west, adding a series of new features that include sunken play areas for children and an "elevated catwalk" overlooking the Hudson River. 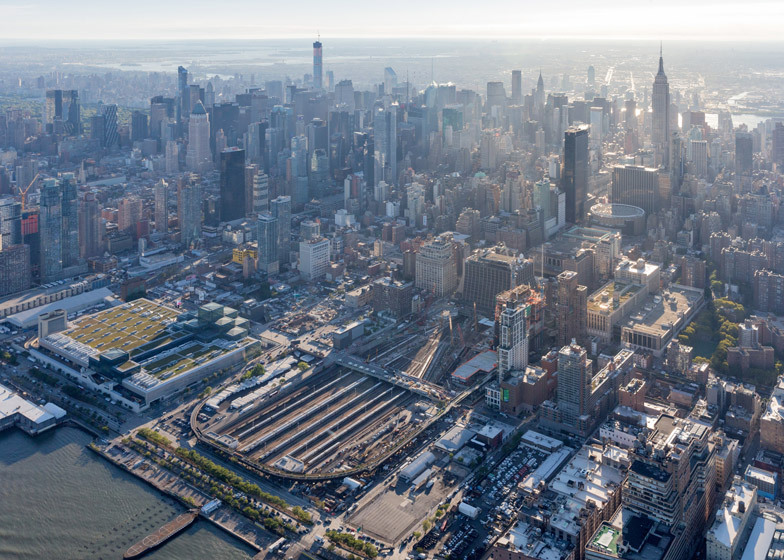 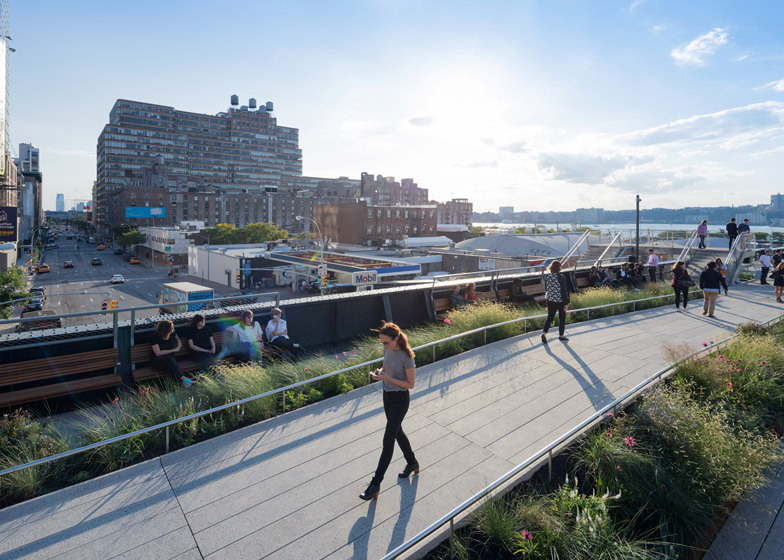 "Representing one-third of the entire High Line, the High Line at the Rail Yards section is one of the most iconic stretches of the High Line, with expansive views of the Hudson River and the Midtown skyline," said James Corner Field Operations in a statement. 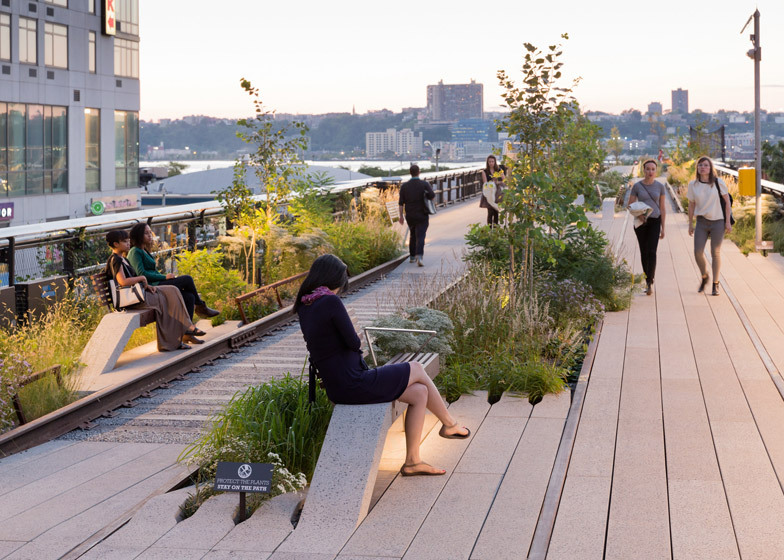 "Here, we were challenged to continue to build upon the identity and success of the existing High Line, yet find a different way to respond to the radically new, 21st-century context of the future Hudson Yards development," said the team, referencing the 11-hectare development underway nearby expected to add 16 new skyscrapers to the city skyline. 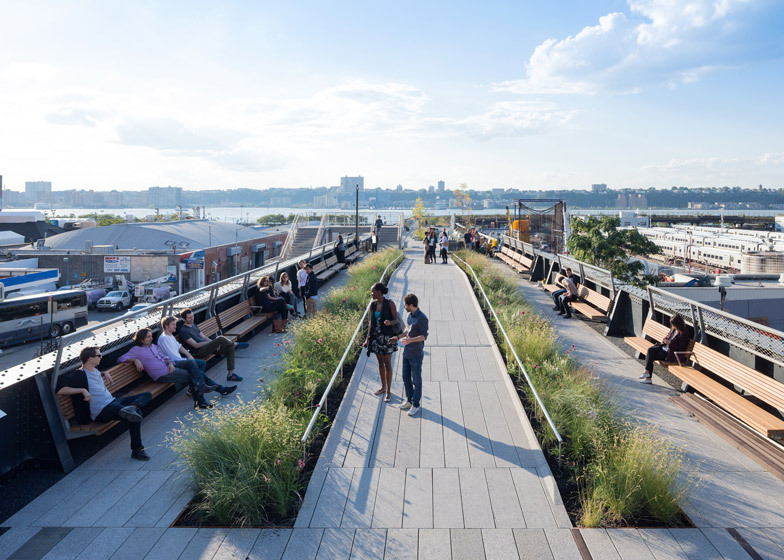 New spaces include 30th Street Grove, described as a "serene gathering spot". 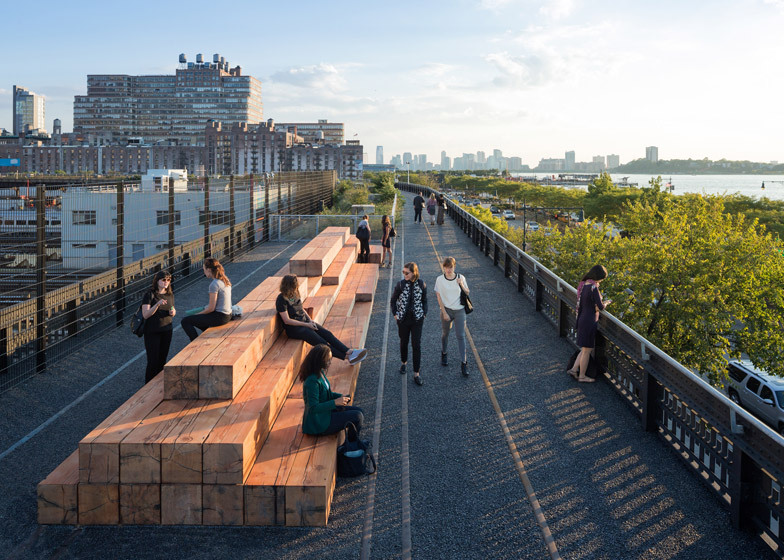 It features a series of picnic areas and furniture elements that appear to peel up from the ground – a theme that continues from earlier phases. 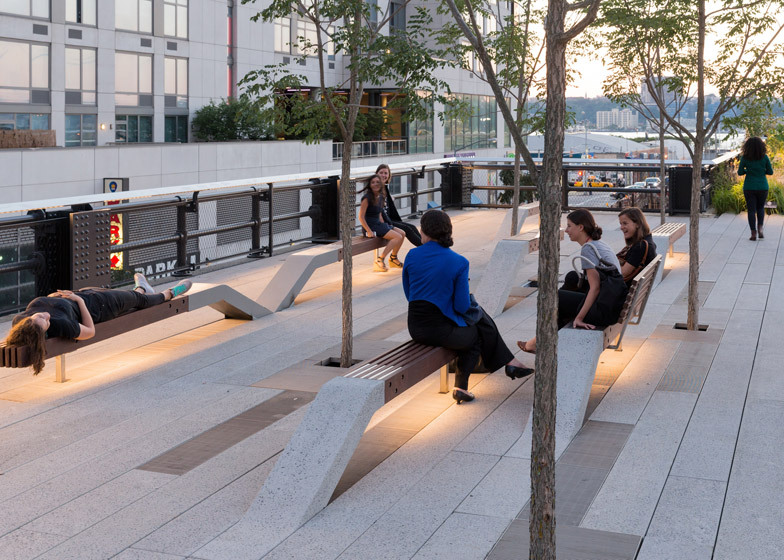 Seating along the Interim Walkway, near West 33rd Street and 12th Avenue. 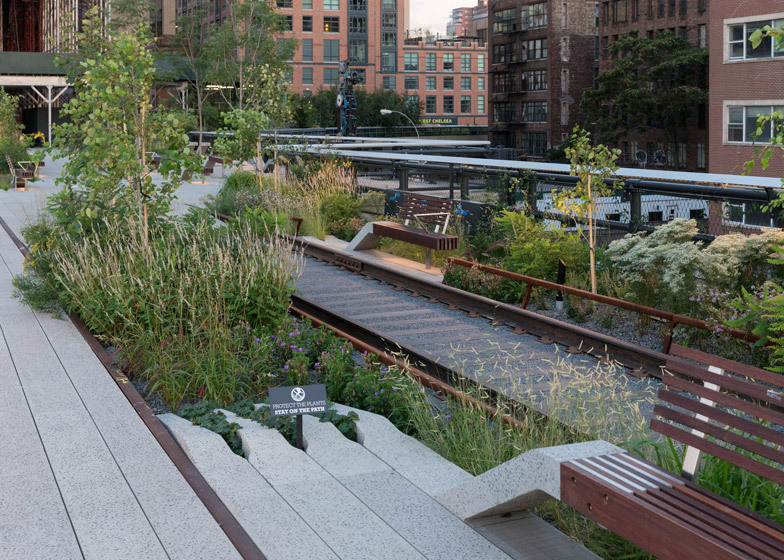 At the northern end of the park, a simple pathway runs alongside wild plants that have sprung up naturally after the railway line was abandoned in 1980. 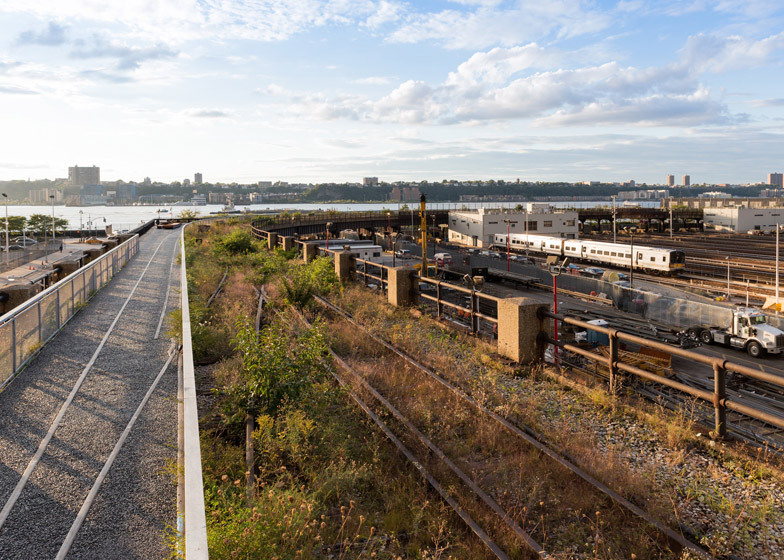 Here, Argentinian artist Adrián Villar Rojas has installed a site-specific work, entitled The Evolution of God. 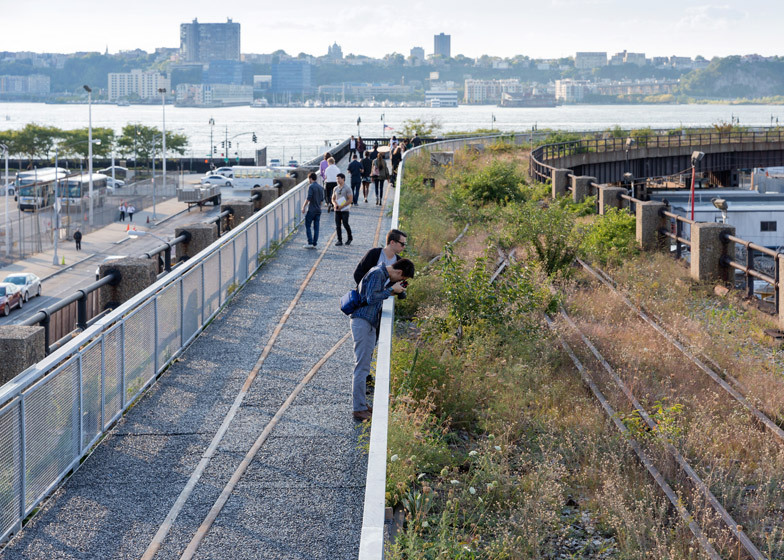 "This latter section along 12th Avenue is perhaps the most authentically subtle design, where the 'original' High Line landscape, with its self-sown grasses and flowers emerging from old tracks, wood ties, and stone ballast, remains intact," said James Corner Field Operations. 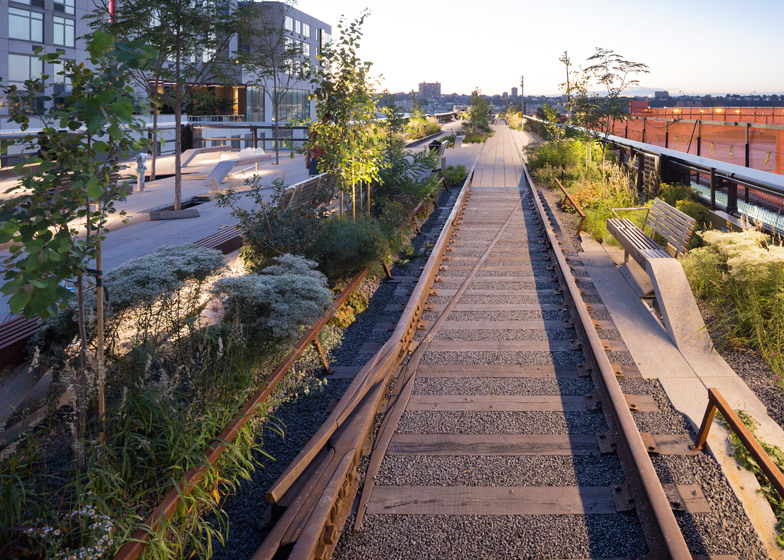 The High Line at the Rail Yards opened to the public yesterday. 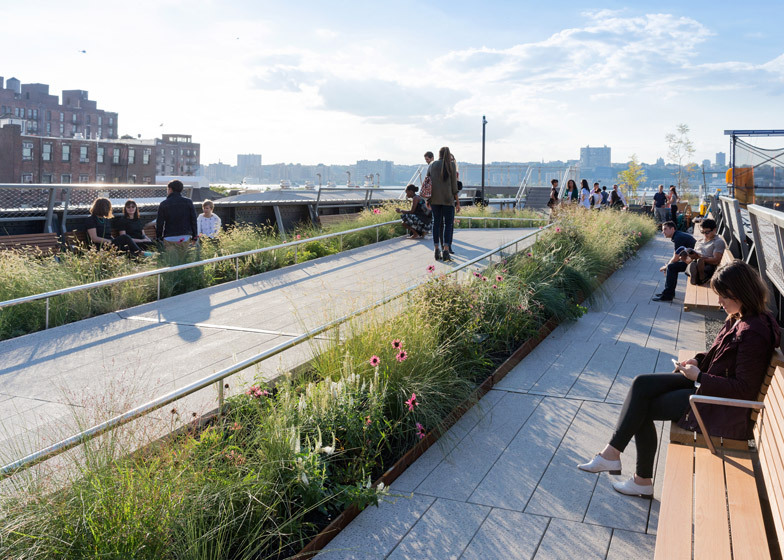 It will later be joined by a bowl-shaped amphitheatre filled with plants, which is set to complete within the next two years over the intersection of 10th Avenue and West 30th Street.